Anxiety is part of being human. We all have things we worry about – both rationally and irrationally. Even though adults have more responsibility, kids are susceptible to anxiety, in large part because they have so much less control over their lives than adults do. Other people decide how they will use huge chunks of their time, every single day. Other people decide who they spend their time with. Add to this the fact that their brains are still developing, and it’s easy to see why many kids struggle with anxiety. 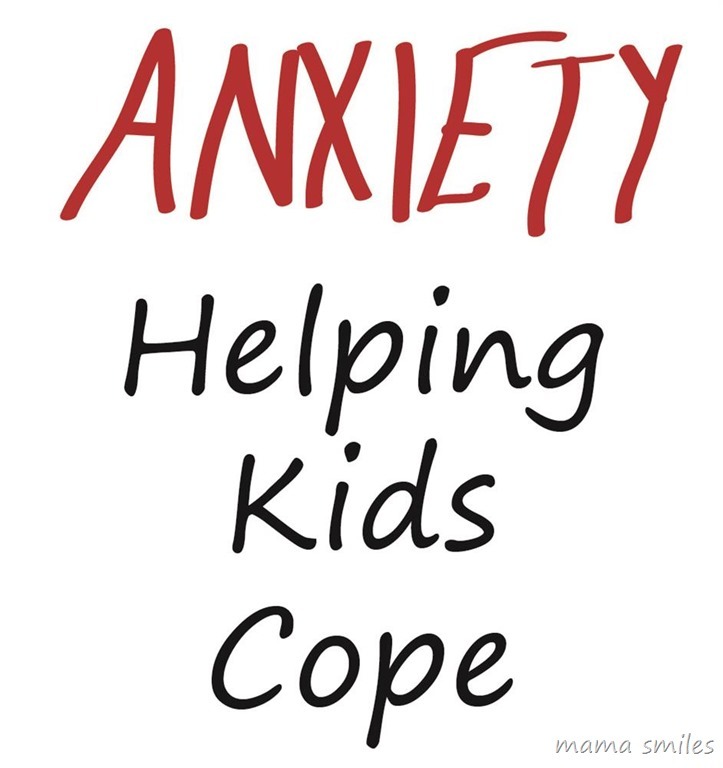 Luckily there are some simple steps you can take towards helping kids cope with anxiety! Here are a few things Mike and I have done to help our kids cope with anxiety and conquer fears. Uncertainty is one of the easiest way to trigger anxiety for all ages, and its antidote is structure! When kids know what to expect when, they feel like they have more control over the situation, and because they know what to expect they are less likely to do things that will leave them feeling upset or embarrassed. Choices are an easy way for kids to feel like they have some control over a situation. Even when they are given two choices they don’t particularly like, they at least get to choose between two different options. Too many choices can add to a child’s anxiety, so be sure to select choices carefully, and make sure that they are well-defined. Kids are exposed to all sorts of information and situations they have never seen before every single day. They need down time to process new information, and to evaluate feelings. Having time to sort through new facts and feelings helps kids stay calm and allows them to figure out how to react to new situations. Responsibility gives children opportunities to make choices and creates chances for them to have a positive impact on the world around them. Assign children clearly-defined tasks that they are fully capable of performing on their own. Areas of responsibility should include things kids will enjoy (deciding what to cook for dinner on a certain day of the week, for example) as well as more rote tasks such as folding laundry or taking out trash. Getting kids involved in service opportunities is a wonderful way to give them some responsibility! I am convinced that the world would be a better place if each person in the world spent thirty minutes in nature every single day – or even once a week! Spending time with plants and animals has a way of helping us put our worries and sorrows into perspective. Make sure you know what your children are exposed to – through school, through books, and through media. Talk to your kids about what they see and hear, and how these experiences make them feel. I cook with my kids and craft with my kids because it is fun and educational, but my biggest motivator for both of these activities is that they tend to open up and talk to me while we are doing things together. Choose a mix of activities you enjoy and that your child enjoys, and make sure that you always listen. I love that my nine-year-old now chooses to do her homework on the kitchen floor while I cook dinner – so that she can ask if she has questions with an assignment, but more often to talk to me about things that happened at school. Family walks and parent-child dates are other things we do to give our children opportunities to talk to us. Kids worry about all sorts of things, and as parents we need to respect their fears. I find that my kids respond well when I listen first and then brainstorm with them about solutions or reasons they maybe don’t need to worry about a particular issue. My kids love hearing stories about my own childhood anxieties! I find that, even when they share fears I had as a kid, talking to them about how I worried about the same thing can make them feel safer and sometimes even laugh. One easy way to reduce anxiety is to help kids make a plan about what to do if the thing they are worried about actually happens. We have talked about everything from what to do if there is a fire (very important to discuss regardless of anxiety levels) to how to deal with stressful school situations. How do you help your kids cope with anxiety and conquer their fears? I found myself nodding my head the whole time reading this! Love this post, and my favorite tips are routine, down time and validating their feelings. Those have been HUGE for my kids. I also think we have to accept kids for who they are and their temperaments instead of trying to fit them into a mold or expectations. The quicker we accept and do this, the less chaos for everyone! Accepting kids for who they are is so important! I love this list! Giving structure, choices and validation totally resonate with me and I notice when I make an effort to do these things for my kids they are definitely less anxious. Structure does not come naturally to me, but it is one of my biggest goals to implement more structure in my weekly routine this year because I know it is so important and worth the effort/struggle. I also love the tip to get outside every day, it makes such a difference for kids and adults. I think structure is a lot of work to set up, but it definitely pays off! We have a routine and any variation to that causes so many problems. It does mean that some things don’t happen like friends after school too regularly but it helps to avoid situations. My kids have gotten better at deviating from routine as they have grown older and (I think this has been key for us) developed better verbal skills – both to understand how things will change and to express disappointment in a calmer way. Hopefully this will happen with your kids as well. I enjoyed reading this. My one tip for older “cerebral” kids is to ask about the likelihood of their worry actually taking place and also ask them if they can change anything to take the situation under control. I have a child who struggles with anxiety and I work with children with anxiety in my therapy practice, so I read (and write!) a lot about it. I appreciate how you point out some ideas that I don’t always think about such as routine and giving limited choices, but also spending time in nature! Thanks! This is a terrific list! I do these things, too, but would have struggled to put it all so nicely into words. My kids’ favourite is to hear me relate my stories, choices, and (frequent!) mistakes. An approach we have started recently that has been working well for us is to discuss fiction together. We have only done picture books so far, but it is a wonderful way to address a number of hypothetical situations. I love how literature gives us opportunities to explore emotions and experiences in a non-threatening way. I agree I think there’s something that has changed with us since we spend so much time inside and in front of technology. Really good list. This is a great post! We have been working through some anxiety with one of our children that was very crippling for quite a while. We have been letting her use an iPod that has guided meditations on them so she can lay there and have someone talk her through letting her thoughts go. It’s been great for her and bedtime is no where near as hard on her as it has been. And I completely agree with you about getting outside in nature! So important!! Thanks again! When my kids have anxiety (usually manifesting from soccer), we go over worst case scenario and then a “pull out avoidance plan” if they try it and can’t deal with it. One of my kids will never opt to avoid; she can just get anxious about joining a new team and trying to play at a higher level. My son gets anxiety about a certain drill (beep test) that he’s sure will happen at practice. It usually doesn’t, but then there was a stretch when they did the beep test every practice for two weeks. (It’s a sprint test where you spring back and forth when the machine beeps with less and less rest. My son gets cramps from it sometimes.) But once he did the beep test over and over again (so as to build up stamina not to get cramps), he’s no longer nervous about it. Facing fears is a good way to tackle some forms of anxiety I have found. The actual thing is always less worrisome than the worry. We deal with anxiety here every day. I agree, spending time in nature really helps! And the biggie: having a schedule (structure) so they know what to expect. Wonderful tips! With my son I try to tell him exactly who we may see when we are meeting friends, remind him there may be other kids at the park, and go over what he can do while we are out if he isn’t comfortable in the situation. And, deep breaths. GREAT ideas for helping kids cope with anxiety! I also find that structure works wonders for my kids.